Home to the Claddagh ring, the center of attention in Ed Sheeran’s newest track and -most importantly- the birthplace of my boyfriend: Galway. A city so special and diverse, you just have to visit! The city Galway (Gaillimh in Irish -don’t even try pronouncing it! ), is situated about 200 km to the west of Dublin and is the capital of the identically named county. In this blog, I’ll highlight some unique things this city has to offer. Yet, there are way more things to experience in this lively city (but that’s for you to discover yourself;))! Definitely the most romantic ring I’ve ever seen: the Claddagh ring. The design of this traditional Irish love ring consists of a heart being clasped by hands and a crown on top, equalling love, friendship and loyalty. Always pay attention to how you’re wearing this ring since it can definitely lead to some awkward situations in an Irish pub! Huh? Well, the ring shows whether you’re romantically available or not. Here’s a quick (and useful!) guide to wearing this special ring: on the right hand, when the heart faces outward, you’re single and ready to mingle. When the heart faces inward, someone has captured your heart and you’re in a relationship. Wearing the ring on your left hand takes it one step further, meaning you’re either engaged or married. Galway is the city when it comes to buskers, also called street performers. Walking from Eyre Square, the city’s main square, to Quay street will lead you along the main shopping area as well as the main places to spot buskers. One of the most famous spots is across Eason’s, Ireland’s well known book store! In short, people strolling the shopping street and buskers showing off their skills, make Galway one of the liveliest cities! The city has it all! Beautiful and colorful architecture, a lively atmosphere and a beach! When reaching the end of Quay street, you keep left and head towards Salthill. A 2km long promenade takes you along beautiful mansions, breathtaking views of the Galway bay and a relaxed beach vibe (so close to one of Ireland’s biggest cities!). At the end of the so called Prom, a pier is situated with lots of youngsters jumping in the water -and having loads of craic (fun!). Salthill is the perfect getaway for a sunny day! 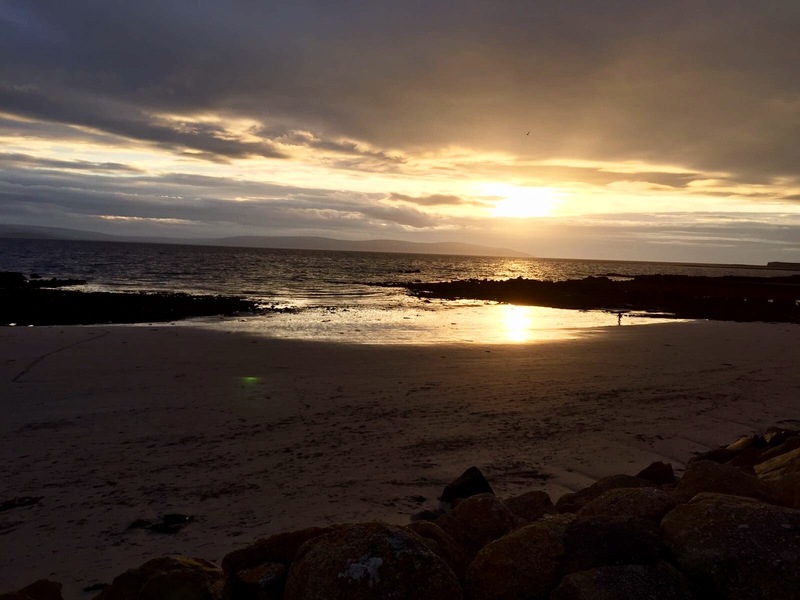 Tip: going uphill at the end of the Prom will lead to breathtaking views of the Galway bay. Near this great and diverse city, are the Cliffs of Moher situated. Check out my blog about this famous landmark here!